This groundbreaking book advances the art and science of natural surface trail design by comprehensively establishing the physical and human forces and relationships acting on natural surface trails. It presents the Foundation Level in a new process for developing natural surface trails. 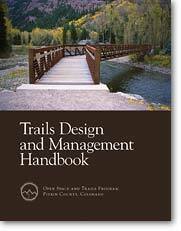 It puts a new foundation of thought under traditional trail design, construction, and maintenance techniques described in other books and by other instructors. 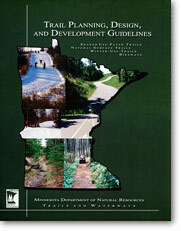 An award-winning publication commissioned by the Minnesota Department of Natural Resource Trails and Waterways Unit as a comprehensive planning, design, construction, and maintenance guide for all trail types and uses. Parker developed the project character and scope, wrote the natural surface trail sections, and provided many of the photographs. A thorough and well-used reference for hard-surface multiple-use trails and crushed stone trails. Rather than a specification for a particular project, this document was commissioned by the Pitkin County, Colorado(Aspen/Snowmass area) Open Space and Trails Program as a guide for the then-new program and an ordinance-by-reference for developers required to provide trails as part of their developments. Rather than a specification for a particular project, it provides guidelines for virtually any project and trail construction method likely to occur in the area. 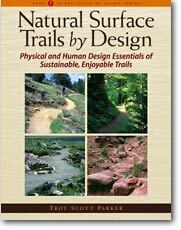 The Trails by Design Series mentioned in Natural Surface Trails by Design (NSTBD, "Book 1") was to have included these additional books. Additional research after NSTBD was published, however, led to such complete integration between trail planning, design, construction, maintenance, management and evaluation that the subjects couldn't be split between multiple books. As of 2011, a new book, Trailshaping, is underway. Trailshaping includes what would have been in all three books but in a simpler, more flexible, easier-to-use form. No publication date is scheduled, but if you are interested in learning the new system, we offer it to select groups through workshops on your own turf. The new system also forms the basis of our trail design and consulting services. Please contact us for more info.